Why don't the children expect Santa to bring their Christmas presents in Spain? 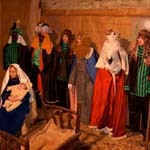 Discover all you want to know about the Three Wise Men Cavalcade! One of the celebrations taking place in Spain that more calls the attention of the foreigner is the Cavalcade of Magi, or the night of the Three Wise Men. Spaniards are always asked how can it be that the Christmas presents don’t arrive to the children on Christmas Eve, but on the night of the 5th of January. The explanation is easy, but the reasons are unclear. 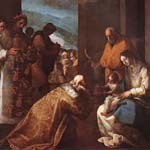 The explanation is that in the catholic tradition there is a great influence of the passage of the Bible in which the Epiphany of the Three Wise Men is narrated. This is reinforced by the fact that one of the most important liturgical dramas, the Auto of the Three Wise Men, was written in Toledo around the XII century. Even though this is more or less an explanation, as we said before, the reason for the choice remains unclear. Why did the Spanish and the Spanish-speaking countries of South America choose to give presents out on the night of the 5th of January? Maybe it is because of the influence of a more catholic tradition, as opposed to the Anglican, Protestant, or Evangelist traditions, that overlook this religious episode. Maybe, but we don’t really know. What we definitely know is that the night of the 5th of January there is a huge celebration in practically all Spanish cities: parades, or Cavalcade of Magi, invade the downtown of many of these cities with a fabulous eye-catching display of carriages and costumes. The purpose of them is to receive the Three Wise Men at their arrival, and getting the spirit ready for a morning of presents and joy. As you may imagine, this is specially so for the youngest of the house, since the children believe the visitors to be real, and expect their presents if they have been good throughout the year. In case they didn’t behave correctly, they will get coal candy instead (or together with their presents). One of the best known and probably the oldest of all these celebrations is the Cavalcade of Magi of Alcoy, in the province of Alicante. Together with Seville’s, it is the most spectacular and colourful, with its elaborate imagery. The first documented celebration of the Cavalcade of Magi of Alcoy dates back to 1866, for what it is considered to be the oldest known cavalcade not only in Spain, but in the whole world. The proximity of the Christmas’ celebration is announced by the Tirisiti, a puppet show that’s been performed since the XIX century. In it there is a mix of elements: the birth of Christ, the arrival of the Three Wise Men, and even the Moors and Christians celebration, which is a very popular event in the city of Alcoy in April. On the evening of the 4th of January, the Royal Ambassador announces the arrival of the Three Wise Men (the Magi), and the children gather around him to listen to the announcement with great excitement. Then, they deposit their letters with their wishes to the Magi in letterbox bags placed on the back of donkeys, which are pulled by the Magi’s pageboys. On the 5th, the Magi finally arrive to Alcoy, and parade the town riding their camels, accompanied by their entourage. The pageboys climb to the houses using a stair, carrying presents with them to give out to the city’s children. Once the parade arrives to the Plaza de España, in the middle of the city, the Kings descend from their camels and head towards the Nativity scene set in the square. In the moment of adoration, the Magi offer the child Jesus gold, frankincense and myrrh, recreating the biblical passage with the music of Händel’s Magnificado sounding in the square. More than a thousand locals take part in the Cavalcade of Magi, which is considered to be an event of International Tourist Interest that attracts thousands of visitors every year.